A truck with bales of burlap bags? Some of my favorite memories of the past were the Christmas parties at the Friedman Bag Company which was started by my uncles in 1927. I wasn’t going to write about this because I didn’t have pretty pictures to show you, but my son, who is fascinated with our family's history, insisted and so here it is. Now you must understand when I started my blog, family memories were not what I was going to write about. I was going to discuss movies to see, television to watch, blogs and books to read, lipstick to wear, food to cook, museums to see and places to travel to. 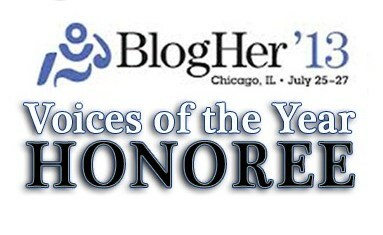 Who knew the direction my blog would take? I certainly didn’t and it's surprised me. I've read about writers never knowing where their characters would take them. I scoffed at the idea. But, want to know something? They're right. I’m going on a journey and have no idea where it will take me. So, I hope you enjoy the ride. 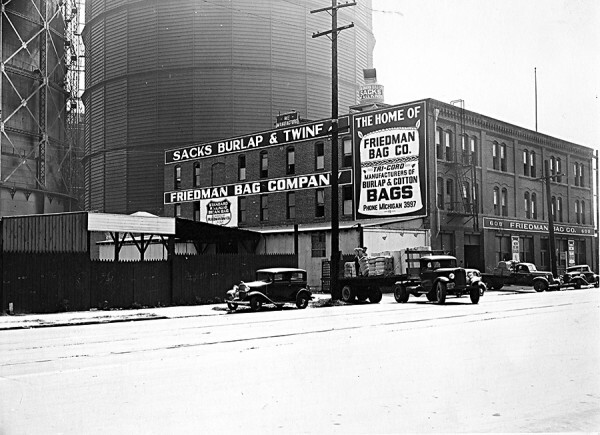 Here's the Friedman Bag Company in 1927. The company made burlap bags for potatoes and other agricultural products. They made them in a huge factory in downtown Los Angeles. It became a landmark when they painted the ventilation fans colors of the rainbow. Most everyone driving on Highway 101 saw those bright colors and smiled. At least I did. Every year, my uncles would have a Christmas party for all their workers and for our families ––– there were five brothers and two sisters and lots of cousins. There were the “older” cousins and “the younger" cousins. In those days, we stuck together in packs of the same age. Today, we all feel that we’re the same age. 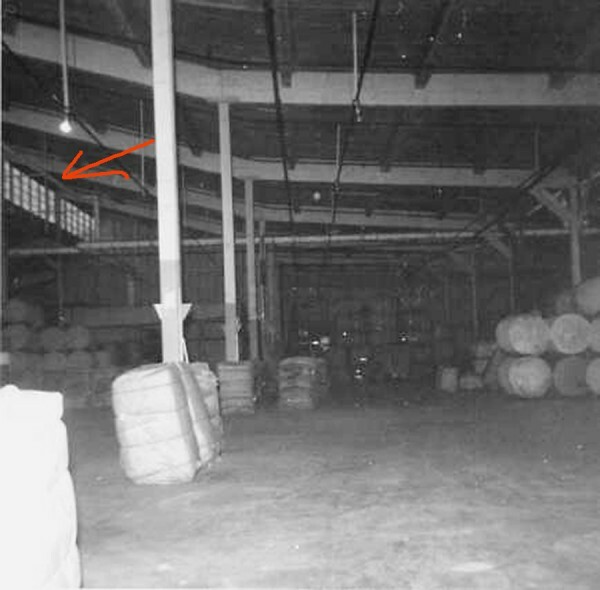 The party was held on the second floor of the factory which was cleared of the bales of burlap sacks so that they could place picnic chairs and tables and set up an area for dancing. I don’t remember much about the dancing, probably because I was having the time of my life running around and up and down the different floors of the factory. All of us cousins had a free-for-all racing around the bag company. There were these huge freight elevators that we’d take to the top floor. Then, we'd climb all over the bales, play hide and seek, and slide down the bag chutes from one floor to the next wrapped in a burlap bag so we could slide faster. We’d also grab the huge flat-bed carts that were used for moving bales and have races as we'd leap from one stack of bales to another. The place was huge so we could run and swoop up the stairs, down the chutes, up the elevator, over the bales, around the bales, around the huge printing presses and then back up again. I was part of the younger group, running around for hours exploring the deep, dark, scary recesses of the factory. When I speak with my cousins today, their favorite family memories are also of those factory Christmas parties. My cousin Annette, reminded me that family members received a bag with Santa printed on it which contained five pounds of walnuts and a pound of See's candy. I remember later, at home, I would sit at the kitchen table with my mother, helping her crack those five pounds of walnuts so that they could be made into strudel. We ate all the See’s candy, first testing to see if it was creamy, chewy or nutty. You know, I still love See’s candy. Don’t care about Godiva, just give me a See's dark chocolate, with caramel and marshmallow and I’m a happy camper. That night after the party, my father would drive home one of the pick-up trucks from the bag company. My sisters and the neighborhood kids would pile into the back (without seat belts) and he would drive us through Beverly Hills so we could see the fancy Christmas decorations. The big homes and sparkling lights were so different from our neighborhood, we were excited to see everything so twinkling. Another holiday tradition was to join my neighborhood buddy, Marty and her sister, Diane in decorating their Christmas tree. Her mother would serve us hot chocolate and I would very carefully place tinsel on the tree. I’m talking massive amounts of tinsel so that the tree really shimmered. Then, I would sleep overnight at Marty's house and the next morning, there would be one special gift for me that my parents had placed under the tree. When I was eight, my favorite gift was a doll I named Teresa. 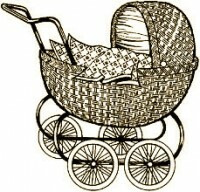 I loved that doll and cared for her as though she were a real baby, feeding, diapering, and dressing her. I took her for long walks around the block in her doll buggy. I kept her for many years. She's the only doll I remember.